One of the biggest expenses when travelling is your accommodation. This is especially true in popular tourist spots. But my wife Rita and I have discovered a way to save money and at the same time experience the country we’re visiting in a more intimate and exciting way. On a trip to Italy, rather than staying at a chain hotel, we rented a small apartment. The internet offers ways of finding some real gems, even for relatively short-term stays. Many people are familiar with sites like AirBnB, but for most of those you are usually sharing a room in someone’s home. I’m talking about using services like FlipKey, HomeAway or even Craigslist to find and rent a private apartment. We were travelling with another couple in Italy, so we searched for a two-bedroom apartment in Florence (a notoriously expensive city to visit) for a week. We found a great place for just over $1,200 for the week, or about $87 a night per couple. Pretty good savings…but that was just the beginning. We chose a location in a neighbourhood in the heart of Florence, just a block from the River Arno and two blocks from the famous Ponte Vecchio bridge. From this location, we were within walking distance of all of the major tourist sights. We could walk to the Uffizi Museum and then cross the river to visit the Boboli Gardens and the Palazzo Pitti. In the other direction was Michelangelo’s Statue of David at the Galleria dell’Accademia. And the walk to visit the Duomo, to admire its green and pink marble façade, was so short we had the energy to climb the 414 steps to the top of the bell tower for a panoramic view of Florence. Having everything so close meant that we didn’t have to spend money on taxis or buses. In fact, we only rented a car for one day, so that we could drive to Pisa to see the Leaning Tower and stop off at the walled city of Lucca on the way “home” to Florence. Our apartment was also within walking distance of the train station, where we hopped on trains to Venice and Naples. For us, the best part of exploring Italy like that was not that it saved us money. What made our trip special was for that week in Florence, we were able to experience living in Italy. We shopped in small neighbourhood shops for bread, meats, wine and cheese; we visited the local coffee house for breakfast; we ate in small, intimate restaurants; and we met and talked to locals everywhere we went. Since we also had a full kitchen we were able to bring home leftovers or shop at the nearby mercato and make our own meals once in a while. Not to mention, keeping some limoncello in the freezer. We were also able to save money by planning in advance. We knew we would want to use the train to get from Florence to Venice, and then from Florence to Naples to continue our Italian adventure. So we purchased a four-day train pass online in advance and then just needed to reserve our seats on the travel days. We also purchased tickets to museums online at a discount. Living in a community also helped us save money by connecting with the locals. In Florence, our landlord knew someone who could meet us at the Naples train station and drive us to the beautiful seafront town of Positano, which was cheaper than a taxi. Once we settled in there, we met a vendor on the beach who had all sorts of “cousins”. He arranged for someone to drive us for a day trip to the ruins of Pompeii, he had a “cousin” who would be happy to get us a discount on a boat trip to Capri, and another who would take care of our laundry for less than $7. We returned from our trip to Italy feeling like we had just spent 17 days living a different lifestyle, and truly experiencing the culture and people of that beautiful country. It wasn’t just a holiday, it was a journey that had a profound effect on our lives and our view of the world around us. Sign up here for IL Australia’s e-letter and we’ll send you free postcard e-letter’s weekly. 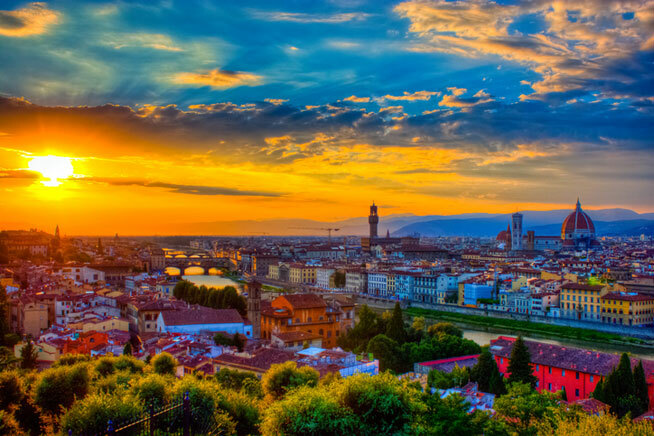 We’ll also send you a FREE research report on Italy: Europe’s Most Seductive Country.